Bay Island Bonsai is a Northern California organization founded in 1998 by Boon Manakitivipart. The organization came into being out of Boon’s desire to improve standards in bonsai. Bonsai Bark is a web site written mostly by Wayne Schoech, publisher of Stone Lantern Publishing and former editor and publisher of Bonsai Today magazine. The Smiths are active in the Dallas Bonsai Club and the Texas Federation. 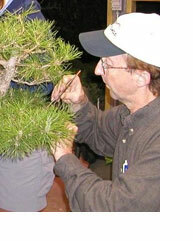 Howard Smith was the first student to complete the Intensive Program from Bonsai Boon. The blog alternative to the mainstream bonsai media—an educational website about the maintenance, care and display of bonsai. student to take the Bonsai Boon Intensive. He is a talented bonsai artist who has recently set up his bonsai studio in Portland, Oregon. This is the Bonsai Federation of California. It is an educational organization which provides services and activities promoting the art of bonsai throughout California. There are seventy clubs in the federation. 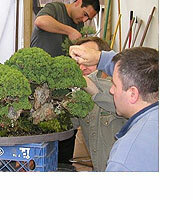 Its main endeavors are to organize an annual bonsai convention in the state and maintain two public bonsai museums. This is a good commercial site. Bill is well known in the international bonsai community. The International Bonsai Symposium in Rochester, New York, is one of the best annual conventions in the U.S. This event includes excellent educational programs. Here you will find Jim Gremel's annealed copper bonsai training wire, bonsai, bonsai pots, Japanese bonsai tools, field-grown trees, aluminum wire, bonsai gallery and more. John Callaway is President of the Greater Louisville Bonsai Society and and active member of the Bonsai Society of Greater Cincinnati. Check out his online store and bonsai blog at the link above. There is an exciting international Bonsai community with some of the singularly best examples of the art form in the world waiting to host you. At PNBCA 2011 meet creative, expert, energetic Bonsai practitioners and visit their studios. September 3-5, 2011 in Seattle, WA. Click here for a digital postcard. 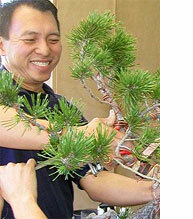 Peter Tea is President of Midori Bonsai Club in San Jose, California. For classes with Peter, please check out his web site at the link above. Chris Johnston is from Kansas City. With a great love for bonsai and as a student of Boon, he has a web site with good information and education. This is the suiseki art web site of Mas Nakajima and Janet Roth.